I love quirky, edgy, strange and surreal. I love intelligent, rule-breaking, ferocious spirits that burn bright. So, it will come as no surprise that I love Viktor & Rolf. I know you weren't expecting to read about haute couture here (yes, no leggings!) but I couldn't resist when I saw the pictures of Viktor & Rolf's ridiculous, amazing, funny and clever haute couture show in Paris. Staged in a gallery, models appeared to be wearing the paintings - complete with wooden frames and paint-spattered canvas clothing. Rather than lurking backstage, designers Viktor & Rolf awaited the models on the catwalk to remove the canvas pieces and hang them on the wall! Thus, creating their own gallery. Check it out on their Instagram. I'm thinking I might frame my yoga leggings and make some sort of psychedelic rock-poster-yoga-style gallery in my living room. It's art. Flowerbomb. 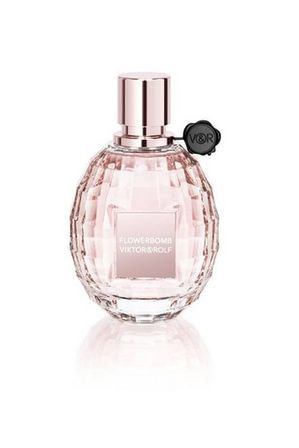 Remember the perfume bottle that looked like a glass grenade full of pink?